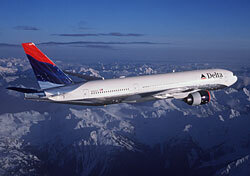 Delta and American Express have teamed up yet again to offer an airline-rewards card. The new SkyPoints credit card allows you to earn points toward discounts on airfare, and points can be transferred into the SkyMiles program as well. You might want to consider trading in your old SkyMiles credit card for a new SkyPoints card. Cardholders can earn SkyPoints at a rate of one point per dollar spent on most purchases and double points at supermarkets, gas stations, drugstores, home improvement stores, hardware stores, and the U.S. postal service, as well as for wireless phone bill payments and Delta or Song purchases. You have several options for what to do with those SkyPoints. You can redeem them for savings on Delta, Delta Connection, Delta Shuttle, or Song flights. As few as 3,000 SkyPoints buy 10 percent off the first $500 of a flight, and as many as 20,000 SkyPoints equal 75 percent off the first $500 of a flight. In order to redeem the savings, you must book and pay for a flight with the SkyPoints American Express card and then request a redemption. The savings will show up as a credit on the following bill statement. Additionally, you can transfer SkyPoints into SkyMiles at a rate of one point to one mile. There is a minimum transfer of 1,000 points but there is no transfer fee, and transferred SkyPoints will appear as SkyMiles within 24 hours. The SkyPoints card is free the first year, with a $49 annual fee for every subsequent year. You will receive a one-time signup bonus of 2,500 SkyPoints and another 2,500 points when the card is renewed after one year. For dedicated Delta flyers, the SkyPoints American Express card gives a little more flexibility than the SkyMiles card. With the SkyMiles card, cardholders can only earn SkyMiles toward an award flight. These days, so many travelers complain about the lack of award availability on most major airlines that some are wary of just earning miles that they may not be able to redeem. The SkyPoints credit card solves this dilemma by giving you a choice. SkyPoints can go toward award tickets, but they can also be applied toward discounts. Discounts are available for most Delta flights without the blackout dates and capacity controls of award seats. And unlike award flights, these discounted flights still earn flight miles toward award travel. The greatest savings—75 percent off—cost 20,000 miles, less than it would cost to redeem a free domestic flight, so you can reach an award threshold in less time. A $500 flight for only $125 could be a better deal than a free flight when you can choose the routing that works best for you, spend fewer points to get it, and earn flight miles to boot. On the other hand, a $1,000 flight would still be a hefty $625 after the discount. But, if you want your points to go toward a pricier flight, you still have the option of transferring your points to miles and trying to redeem an award. The flexibility of the SkyPoints card means that you can figure out which method of redemption will get you the best value award for each trip you want to take. The SkyMiles credit card isn’t as accommodating. The SkyPoints American Express is free for the first year, so if you’re interested, you have nothing to lose by taking the card for a test drive before you commit. Don’t forget to check out other features, such as the annual percentage rate and card amenities, to make sure the SkyPoints card is right for you in more ways than just award redemption. For more information or to apply for a card, visit the American Express website.